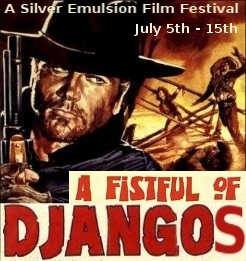 6 comments to Starting July 5th: A Fistful of Djangos! Will this include Sukiyaki Western Django? No this series will be strictly focused on Django films made fairly close after the original. We might get to that one in a sequel if this one goes over well. Thanks for coming by and commenting! Very nice, a bold move I’ve been out foxed again! Thanks! Were you planning a Django write-up? Looking forward to reviewing these films with you, pal. This is the biggest event we have ever planned here at Silver Emulsion… until we do our 8 film retrospective on the films of Benji, coming this winter. You won’t be able to keep your paws off it! HAHAHAHA, nice. It would no doubt be the first of its kind. We could follow it up with an in-depth look at the Air Bud series of films.